In the lead up to the tournament, the main issue was whether or not to cancel. The Nailsea lawns had had a major levelling project which began last September and had been thwarted at every turn by the weather. Endless rain including flash floods, two bouts of snow, freezing cold and then hot dry spells had played havoc with germination so the grass, at best was uneven. Some areas had been underwater continuously for months, leading to colonisation by meadow grass instead of the germination of the rye grass seeds. Then the rye grass got stressed by the June drought (like stressed people, it went grey!) and emergency supplies of high nitrogen fertiliser were dispatched by Duncan Hector and another daily irrigation programme was instigated. At last, the lawns looked green. In spite of several major and minor re-seeding efforts, they still had uneven grass coverage but were pronounced playable and the tournament went ahead. The uneven surface made rushing tricky and balls sometimes bounced, particularly for players whose natural style is to hit down on the balls but at least the Nailsea mini-Mendips had disappeared. The euthanised meadow grass clumps were still there but not causing too much extra grief. Nailsea is renowned for its firm hoops but these were set to a generous eighth and the hoop areas were watered to soften the ground a bit. Conditions were still difficult but, ironically, players at neighbouring clubs were having to cope with glass-like conditions as lawns turned brown in the dry heat. Once the tournament got underway, the focus of attention soon switched to 17 year old James Galpin. Although he is National Junior Champion, this was his first tournament at senior level. In spite of the difficult conditions, James played confidently and fluidly and won his first ever Advanced Rules match with a rover peel and 4 minutes to spare. 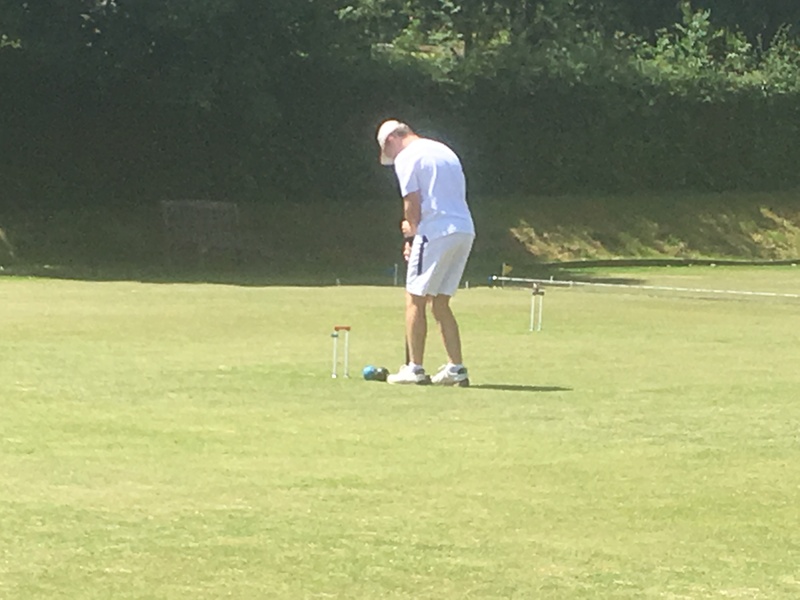 In the second and third rounds, James got both balls most of the way round quite quickly but then got becalmed and eventually won them both on time. With 3 blocks of 4, the semi-finals would be between the Block winners and the best runner up. James, David Hunt (Nailsea) and Philip de Glanville (Bath) had won all their block games. The best runner up slot was far from clear with Peter Dyke (Nailsea) and David Marcus (Southwick) having very similar records in all respects. Peter, as the home player, very nobly stood down to give a place to the visitor. However, David Marcus withdrew from the tournament on the Sunday morning and Peter was reinstated and went on to beat Philip de Glanville. In the other semi-final, David Hunt had led James for nearly 3 hours and was 2 hoops ahead when James began his final turn. James showed huge character by producing his best turn of the day and turning the result round. It seemed written in the stars that the Final would be between Peter Dyke, well known for his successful coaching of juniors and his latest protégé. The weather was scorching and the hoops had become more unfriendly in the dry ground so the match was slow with neither player able to sustain breaks. When time was called, Peter was slightly ahead and on the lawn so hit his ball into a corner when he broke down. For the second time in the day, James had to dig deep and pull off some tricky shots, including a 3 or 4 yard take-off to get in front of 3 back. It was perfect and he ran the hoop to clinch the victory. The two CA handicappers present were in no doubt that James should have his handicap reduced from 7 and they decided upon 4 as a suitable number. Elsewhere on the lawns, the players were hot but cheerful. Philip de Glanville had played well and smiled all weekend and won the 3rd place play-off. Brian McCausland (Nailsea) won the consolation knockout competition and also the prize for the fastest win – he had pegged out with 12 minutes to spare. Margot Soakell (Bristol) was runner-up in this consolation event and her wins gave her a handicap reduction from 7 to 6. Philip de Glanville and James Galpin won prizes for causing the biggest upsets. In both cases, they were 7s and had beaten two different 5s. The manager thanked the Nailsea members for their usual superb club spirit in preparing the lawns, producing delicious food and generally being excellent hosts. It was heartening to see so many people enjoying taking their AC game on to the next stage, or in some cases, letting it wind down from dizzier heights! Now that the Nailsea lawns are basically flat, we hope that they will provide superb surfaces very soon.